(Haymarket, Va) We are proud to announce that effective immediately, Alex Saunders will serve as the VSA Select Director. Alex will be responsible for the operations of the Select Program on a day to day basis. 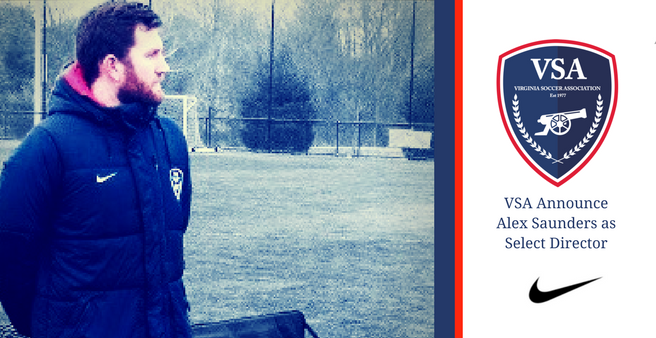 Having joined VSA in August of 2017, Alex has become a valued part of our coaching team. We feel this is the appropriate next step in his coaching career. Alex brings good experience to the new Select Director role. Alex’s primary duty will be ensuring the organization and continued quality of the Select Program. During the last 3 years, our Select Program has grown tremendously in quantity and quality. Our current Select teams participate in the NCSL and ODSL, with multiple teams competing within the top four divisions in multiple age groups. Prior to his first year here, Alex spent two years with the Colorado Rapids (MLS) Front Office serving as a Youth Soccer Liaison where he helped establish and grow relationships between the Colorado Rapids and over thirty-plus youth soccer clubs in the greater Colorado area. Alex also spent time working with the MLS. Alex graduated from the University of Hawaii at Manoa with a Bachelors Degree in Marketing, International Business & Finance. He also spent time studying at the International College of Seville in Spain and is fluent in Spanish as a second Language.